Universal software for real-life optimization tasks. IOSO NS Gt v.2.0 is the program package implementing IOSO Technology algorithms for a single-objective nonlinear optimization with a moderate number of design variables (up to 100). 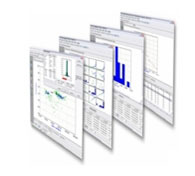 Easily integrating software for solving all spectrum of optimization tasks. IOSO Software is based on open architecture and therefore is compatible with almost all CAM/CAD/CAE applications both commercial and in-house. All IOSO-based software packages were developed according to the common concept of the optimization task statement including initial data settings, data exchange with user's applications, and the analysis of the obtained results. Details..